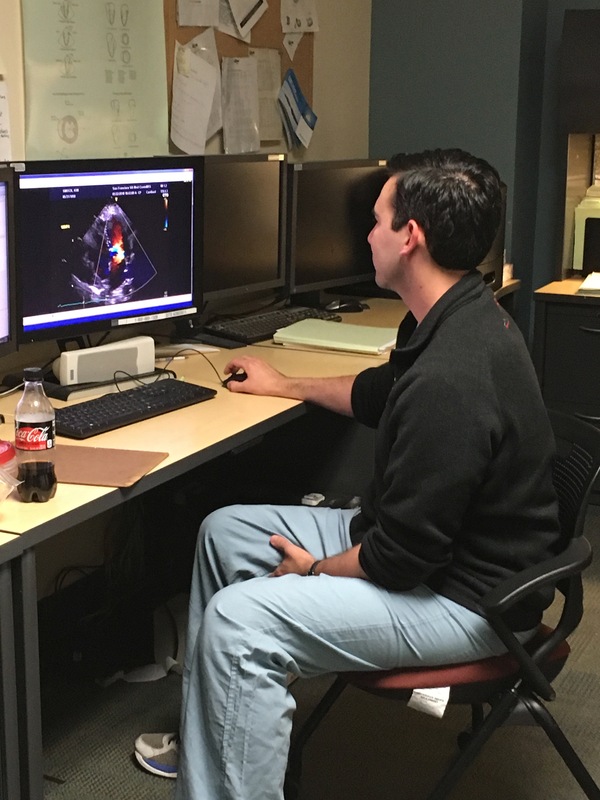 Each month, we have four core cardiology fellows rotating with us on clinical rotations in the cath lab, EP lab, echo and stress lab, and on the cardiac intensive care and cardiology consult services. The VA provides a unique first-year fellow exposure to electrophysiology. Fellows enjoy the 1:1 feedback provided during afternoon echocardiography reading sessions with our attendings. The large procedural volume at the VA and the challenging procedures performed here greatly enhance the fellows’ learning. Eight fellows have their longitudinal outpatient cardiology clinic experience at the VA, proctored by our faculty. This clinic experience has been consistently sought after by fellows who relish the opportunity to care for our special population and enjoy the ability to easily communicate with care providers across disciplines. Many of our advanced fellows rotate through the VA as well, including electrophysiology fellows and cardiac interventional fellows. We are particularly proud of our weekly journal club and multidisciplinary cardiac cath conference.